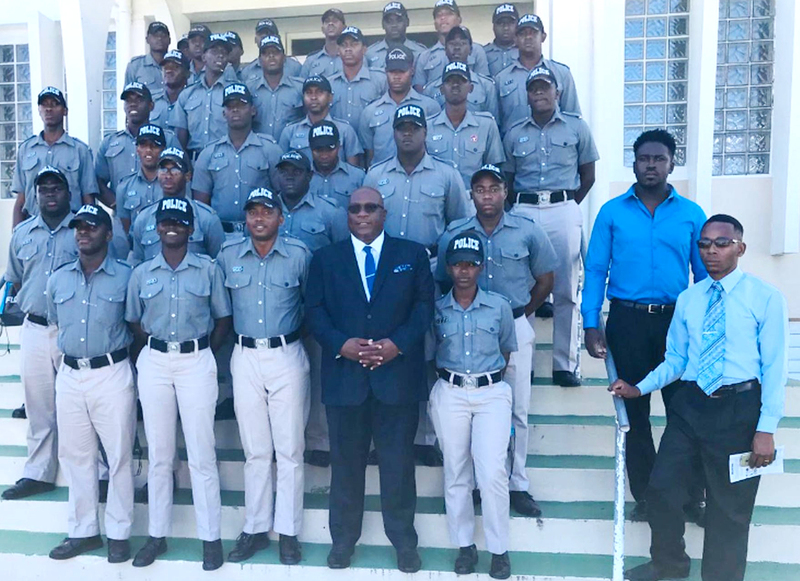 Police trainees from Course #42 with Prime Minister Harris. They attended the annual Friendship Sunday service held at the Mount Carmel Baptist Church last year in October. BASSETERRE, St. Kitts –- The situation in which uniformed police officers are working without first receiving training is being addressed by the government by requiring all officers to complete formal training. Since 2015, 98 police recruits have graduated from three training courses. According to the prime minister, in 2018 alone apart from the police recruits, 155 police officers already in the establishment received training. Forty-three went overseas to attend courses in a range of disciplines, while 112 officers received training in St. Kitts and Nevis. The three recruitment-training courses held since the Team Unity Administration came into office are courses #40, #41, and #42. Ninety-eight 98 police recruits graduated. Another batch of police officers go into training soon, thereby strengthening the country’s own domestic capacity to respond to and pre-empt the occurrence of criminal activities. Saying that citizens, residents and visitors are deeply appreciative of the work of the country’s law enforcement officers, the Minister of National Security encouraged the country’s security officers to exhibit utmost professionalism when serving and protecting the people.